I’ve been obsessed with the human brain. As a software engineer looking to learn more about this incredible organ, I’ve found myself using the tools I know (code), to try to understand more of what’s going on inside our minds. My early experiments involved visualizing brainwaves (EEG) in the browser. My thinking was, if I could visualize it, I could better understand it. From there, I could start exploring behavioral experiments. And that is how my journey to connecting the brain to the browser began. From all the crazy ideas about the potential uses of brainwaves, I kept going back to the thought of “mind-controlling” stuff. And by this, I mean attempting to steer the brain frequencies and use these changes to detect intent. For example, it is known that during meditation, the alpha waves produced by your brain increase. The same way beta waves are associated with active thinking and concentration. During the first experiment, I was able to sharpen a blurred image based on concentration levels. The more you focus, the clearer the image gets. But, what if we could use meditation levels to control a sequence of images? If given a video of a flower blooming (starting with a bud), could we make a flower bloom if we reach a deep state of mindfulness while meditating? That got me thinking. If we could map some mind states to certain UI controls on the web, like a video player, that would be a fun experiment. Let’s go through how we can capture brainwaves, get meditation and attention levels, send the data to the browser, and map it to the playback of a video element. In other words, let’s build a mind-controlled HTML5 video! 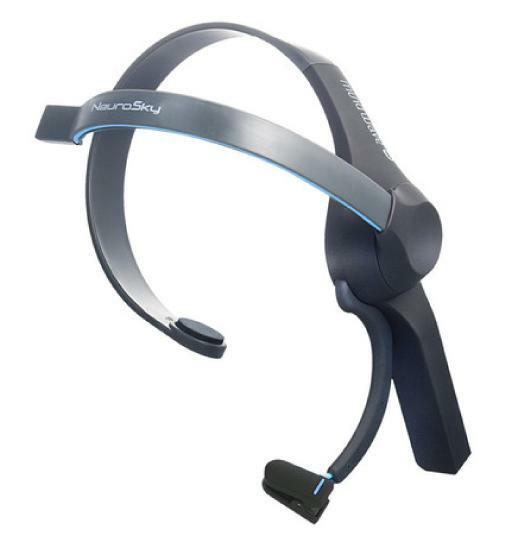 The MindWave is a single channel, Bluetooth headset. One of the reasons I like experimenting with the MindWave is because other than being very affordable, unlike many other headsets, this one features hardware embedded algorithms called eSense. These algorithms rate attention and meditation levels from 0 to 100 by computing time and frequency domains, including alpha and beta waves. And these are exactly the metrics we’ll be using to control UI elements such as the HTML5 video element. I always like to start projects that interact with brain-computer interfaces by getting the hardware setup and ready to stream. So in order to do that, let’s download the ThinkGear Connector. The ThinkGear Connector runs continuously in the background. It keeps an open socket on the local user’s computer, allowing applications to connect to it and receive information from the MindWave headset. You can find the connector on the NeuroSky website. Make sure to download v4.1.8. It only works with that version (don’t ask me why). Next, we’ll use Node. Luckily, there’s already a Node library for accessing the connector’s open socket. Other than that, we’ll be using RxJS and Socket.io. It is important to note new data will be received every second. Now we just need to add Socket.io and start emitting the data to the browser as we receive it from the headset. Two important things to notice are the socket port (4501) and the socket event name (metric/eeg). We’ll need these later. That’s all the code we’ll need in order to get the data and send it to the browser. Let’s start by creating a new project. If you are using the Angular CLI, which I highly recommend, just enter the following commands to the terminal. These commands will create a new Angular project, serve the app locally, and add a component shell called MindVideoPlayerComponent. The new component should look something like this. Let’s start by adding some properties to the MindVideoPlayerComponent class. We’ll need the name of the metric we’ll be using to control the video player (in this case meditation). We’ll also need video metadata including url, type, length in seconds and fps (frames per second). We’ll use these values later in our template and for some of the business logic. Next, let’s bring some RxJS observable types and the Socket.io client to our component. The socket client uses the event pattern. Let’s create an observable from its events by passing the Socket.io client as the event target and metric/eeg as the event name. We’ll call the observable stream$. The dollar sign suffix is just for semantics and indicates that we dealing with an observable type. Then we import the map operator and pipe it in the stream observable in order to pick the metric we want to work with (in this case meditation). Now we have a stream of meditation values ranging from 0 to 100, which are received every second. The next step is to manually animate the video playback. There’s nothing out there that can animate the playback between two different times because this is not the way people traditionally interact with video on the web. So, we’ll need to get a little bit creative in order to tackle this next challenge. The idea is to create a range between the latest metric value and the previous metric value. That will slowly update the video playback to every value in between over a period of time (one second). This is the same length of time we receive a new value from the server. So by the time the animation is completed, we get new data and do it all over again. For this, we’ll need some observable types and operators, as well as the linspace library. Let's break this down line by line. 1) We create a new class property and assign the metricValue$ observable as value with some transformations via lettable operators. Let’s say we get the values 0, 20, 80 and 50 with one second in between each value. 2) We pipe the scan operator in order to access the previous metricValue as we get a new value. Then we return an array with the previous value at index 0 and the next value at index 1. The result would be [0, 20], [20, 80], [80, 50] and finally [50,0]. 3) We then pipe switchMap to allow the metric to always switch to its latest value even if the inner observable emits at a later time. By destructuring the array mentioned previously, we can name its values based on index position. 4) We return a range observable of 60 values from the the previous metric value to the latest metric value. For example, if the meditation level goes from 20 to 80, the range will roughly be: [20, 21, 22, 23, … , 77, 78, 79, 80]. The length of the range is 60 so the transition runs at 60 frames per second (fps). For the range operation, we’ll use a library called linspace that does exactly what we are looking for. 5) We spread out the range observable and emit its values over a period of one second. 6) We transform metricValue to it’s relative value in seconds since we plan to bind this observable to the currentTime property of the video. Here's the full component class. Lastly, we’ll switch to our component template file. As far as markup goes, we’ll only need a video element with its source element. At this point we can start binding the component’s class properties to the DOM properties of the elements in our template. This is where Angular really shines. Once again, let’s go through it line by line. 1) We bind the currentTime DOM property of the native HTML5 video player to the currentTime$ observable and pipe it as async so Angular can handle the observable subscription for us. It works like magic. 2) We bind the video src and type properties of the video value in our component class to the DOM. That’s all the UI code we’ll need for the experiment. You can find the complete project on GitHub. Now that we’ve put all the pieces together, let’s see how this works in practice. The following video shows real meditation levels with eyes closed in a quiet environment. This setting helps achieve better meditation results. I’ve demoed this experiment in some meetups and conferences around the world. I’m always impressed on how easy it is for some people and how difficult it is for others to get high meditation and concentration levels. The human mind never seizes to amaze me. 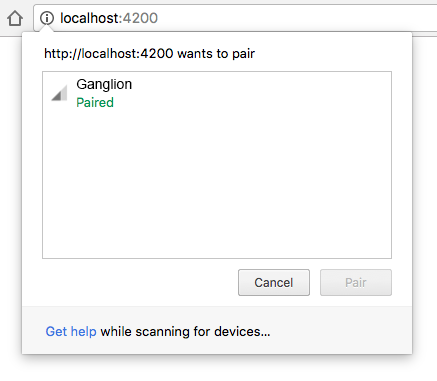 With the new Web Bluetooth API landing in Google Chrome, It is now possible to get a data stream from the Ganglion board directly in the web browser. After calling the the init function from user interaction (e.g. button click), the browser will display Ganglion as part of the device list. After pairing the device, the browser will show the Web Bluetooth indicator on the right side of the tab, and the data from the Ganglion will be logged in the browser console. In an effort to add reactive programming capabilities to the OpenBCI Node SDKs, we’ve created a layer of abstraction that features the same API for working with the Cyton, Ganglion and, WiFi shield in Node. The usage for these set of classes is exactly the same as the browser API. This means it is possible to migrate the code from server to client and vice versa, painlessly. Working with RxJS has allowed us to easily control the data flow, buffer over a period of time and, apply data transformations in a reactive, performant, and immutable fashion. When working with EEG, we usually do the same data processing over and over again. That’s why we’ve created EEG Pipes. This project features a set of RxJS operators that allow to easily do transforms to data streams from all projects mentioned above. The code sample above will output an FFT buffer of alpha waves. Other operators include filtering channels, low pass and notch filters, buffering, and more. For a demo on the use of these packages for visualizing a time series with Angular, visit the angular-openbci-rx project. Special thanks to AJ Keller from Push The World for his help and guidance. My friend Teon recently got me a Muse 2016 Headband. To my surprise, this version of the headband is not currently compatible with the Muse IO, which means accessing the data is not possible via the Muse desktop apps. If your browser does not support Web Bluetooth, try using a polyfill. To get started, let’s install the awesome library Uri published in order to simplify the communication with the Muse via Web Bluetooth. Next we can import the MuseClient class and create a new instance of it. At this point, after clicking the connect button, we can select our Muse device from the list, and click on “Pair”. This may take up to a few minutes, so make sure your device is turned on so it can be discovered. You should be able to see the Bluetooth icon to the right side of the browser tab. We can safely say Web Bluetooth is now paired and enabled. Which means we are ready to start streaming some data! So let’s write our stream function. It is important to note that the value of muse.eegReadings is an Observable. That is why we can call its subscribe method. For more information about Observables and how to work with them, check out rxjs. Similarly, we now also have access to telemetryData (battery info) and accelerometerData (orientation info) from our muse instance. We can subscribe to them as well just like we did with eegReadings. Remember our connect function? Let’s make sure we call our stream function in our connect function so we can start streaming data as soon as we connect. That’s it, check out your console and see the data stream at 200hz. If you are interested is seeing an example of a time series chart using Angular, check out some of our work in progress on GitHub. Do you own a Muse headband and have meaning to do amazing things with brainwaves on the web? Share your experience! Tech People at Work Podcast: "Relocating for work with Alex Castillo"
today we have Alex Castillo on the show, and we’re going to be chatting about his transition coming from New York City all the way to California in chase of a dream job. He’s now working at Netflix, and we’re going to be chatting about some of the day-to-day things that he’s doing at Netflix, but also some of the aspects of his transition and I think a few key areas that had made it better for him, or easier, that Netflix has been a part of, which I think is really important for everybody who’s interested in basically moving to another part of the country or employers who are interested in hiring people from other parts of the country. At FullStack 2016, I most look forward to learning about IoT, specially with Tessel 2 and Espruino. My talk will be enjoyed by researchers, engineers, artists, scientists, designers, makers, and anyone interested in building or using the next generation of open source tools for the human brain. The Notifications API has been available for some browsers for a while now, and with Angular 2’s recent promotion to Release Candidate (yay! ), I thought bringing this powerful API to the Angular world in the form of a library, would make this API more accessible and reusable for developers. Enter ng2-notifications. In the following demo, notifications can be customized and displayed using ng2-notifications. Give it a try! The import statement can be included in any Angular 2 component. body="A simple npm install can get you there"
One of Angular 2’s most powerful features is its declarative markup. With ng2-notifications, a push notification can be written in Angular 2 with the use of literals or my personal favorite; data binding. The ng2-notifications library is just a wrapper for the native Web Notifications API. It abstracts and simplifies the process of requesting the user’s permission for notifications and exposes a predictable and easy to use API in the form of an Angular 2 Component. You may wonder, why not use a component instead? Well, a component is just a directive + a view, and in this case a view is not required since the UI is completely handled by the browser. That’s one of the reasons why notifications will look slightly different in every browser. Additionally, the library adds two useful properties: [closeDelay] and [when]. The close delay does exactly what you are thinking, it closes the notifications after x amount of milliseconds. The when property is used to activate the notification given a boolean expression. Think of it as an "ng-show". Understanding Angular 2’s Directive lifecycle is crucial for showing and closing notifications at the right time: when the directive compiles, when data properties changes and when the directive is removed from its parent component. From the import statement above we can see three very important Angular APIs that can help us hook into certain Directive’s states by implementing these into our Directive’s class definition. These are just a few of the crucial parts for building a Directive in Angular 2. For the full source code, check out the project on GitHub. Brainwaves. Electrical impulses in the brain. That's what I've been working with after I got my hands on the UltraCortex MK III, a kickstarted-funded brain-computer interface from a Brooklyn-based startup called OpenBCI. In order to get started with the OpenBCI SDK, we'll start on the server side and use Node.js to get the data streaming from the BCI via serial port. var argv = require('yargs').argv; // Yargs be a node.js library fer hearties tryin' ter parse optstrings. Let's run it and see those brainwaves stream! On your Node console you should be able to see the samples being logged. Now the next challenge is to access the data on from the browser. For simplicity's sake, I've used socket.io to emit events and socket.io-client to subscribe to those events from the browser. So, let's add both dependencies to our project. Using socket.io is very straightforward. After opening a connection, we can start emitting our custom 'brainwave' event. This approach is a very simplified version of receiving and sending EEG data to the font-end. We are currently emitting socket events every 4 milliseconds which is not the best of ideas from a performance standpoint. Recently, my coworker Rick was working on some wires using a UI control to decrease/increase text size. He asked me about any technical risks of using a slider on mobile/desktop, as opposed to the usual click/tap on plus/minus to increase decrease text size and this is what I came up with by using: AngularJS, HTML5 and CSS3. See the Pen Text Size via HTML5 Slider by Alex Castillo (@alexandercastillo) on CodePen. * All attributes are required. The implementation of this directive is simple. We define an Angular Directive. Specify a template containing an input type range (HTML5's native slider). Add an ngModel to the slider. Then, we watch the ngModel of the slider for changes, and we set the body's font size to the current value of the slider's ngModel. A native input type range HTML element will have different default style depending on the browser used. Luckily, we can change the default appearance of sliders with CSS3. The code below was targeted for Webkit browsers (Chrome, Opera nad Safari) specifically. For Firefox and IE, please visit see this tutorial. According to caniuse.com there is 88.8% browser support for the input type range (#2). This year for the second time, I had the honor of giving a lecture to the Products of Design students at the School of Visual Arts, titled "Programming for the Web". I have made this presentation available for everyone in order to encourage Web Developers to spread their knowledge. I'm very excited to present this month's AngularJS NYC Meetup. My talk will be about "CSS Architecture for Large-scale Angular Apps". In Angular we can attach templates (structure) and controllers (behavior) to pages and components. AngularCSS enables the last missing piece: attaching stylesheets (presentation). AngularCSS is an AngularJS module that optimizes the presentation layer of single-page apps. It extends the Angular API for CSS architecture including: dynamic CSS injection, stylesheet lazy-loading, responsive design utilities and cache features. Where: Chelsea Market building at 75 9th avenue between 15th St and 16th St. New York, NY. With the explosive growth of web applications, it’s important more than ever for developers and organizations to fully leverage the web’s power by investing in the right framework. There are almost too many options to choose from, but one framework stands above the rest… AngularJS. Let’s take a look at some important qualities of this tool and see how it could benefit you. Community - Another important aspect to consider would be the AngularJS community. Aside from the excellent API documentation, Angular has a very impressive community support. From stackoverflow to IRC and even from the creators themselves. In 2013, AngularJS was ranked #4 on the most contributed open source projects in the world. Impressive, huh? Their constant meet-ups and the conferences show how passionate the creators, maintainers, supporters, sponsors and contributors are about this amazing technology. How does it help in building apps? Efficiency - All these benefits translate accordingly on the business side of things. Less boilerplate code equals less development time. More testability equals less bugs in your application, which equals to less QA and UAT time and resources. Less time and resources equals shorter timelines and smaller budgets. Sounds like a win-win, right? Who else is using AngularJS? Everyone Who Is Anyone - Google is and has been using Angular for many internal and public facing projects. Some of Google’s most ambitious projects have been built with Angular, like their DoubleClick platform, which has been one of the biggest AngularJS apps that has been pushed to production. Other Angular projects include YouTube for Sony's PlayStation 3, Udacity, Lynda.com and many more. View the full report in Google Trends here. AngularJS is rapidly becoming the go-to front-end framework for web-apps and developers love it. What do you think of Angular? Let me know by commenting below.